This page lets you set access restrictions which apply to all VPOP3's services. 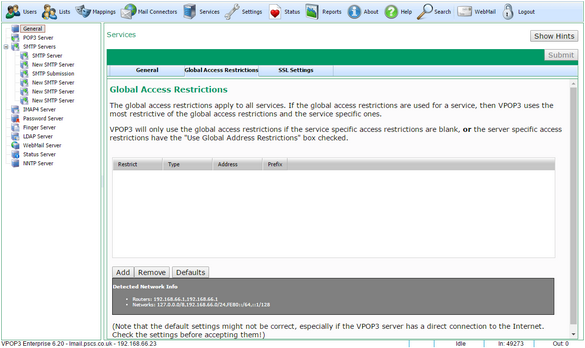 Access Restrictions limit which IP addresses can access the services. In most cases this is left blank so that only the service-specific access restrictions apply, but if you add extra restrictions here, then they will apply in addition to the service-specific restrictions. A connection will have to pass both sets of access restrictions to be allowed. This can cause confusion when trying to add extra 'allow' restrictions because you may add an 'allow' restriction to the service-specific restrictions but it may still be denied by the global restrictions, so it won't work.